Beside Myself is the debut novel from Ann Morgan and all I can say is wow, I really loved this book. The first thing that caught my attention was the cover, such a simple yet striking design, I just had to find out more. The story itself is about identical twin girls Helen and Ellie. Helen is the popular, more capable and intelligent twin while Ellie has some challenges that set her apart from Helen in the eyes of both her mum and her peers. She is the less popular twin. Then one day at the age of 6, Helen and Ellie decide to swap places. It was only supposed to be a game, it was only supposed to be for one day. But what happens when one twin, the unpopular twin decides that she likes her new persona and doesn’t want to give it back. When Ellie refuses to switch back, Helens nightmare begins, a nightmare that she can never wake up from. She loses everything, her toys, her clothes, her friends, her glowing record at school, the favour of her mother and the future she had dreamed of. She loses her identity. As the years pass, not only do the memories of that day fade but so too does her sense of self until eventually only “Smudge” is left. This is a gripping and psychological read with many serious and confronting themes throughout, abuse, mental health, toxic relationships, self harm, fractured identities to name a few. But the one thing I can say about this story is that it makes for a compulsive, unputdownable read with characters that have been written with the greatest of sympathy. It is fast paced and at no point does it fail to get into your head and draw you in. Beside Myself is one of the best books I have read this year. I would recommend this book to anyone that likes a powerful psychological read. It deals with the darkness that surrounds mental health. The reader really gets a feel for what it is like to be Smudge and just how broken and despondent one becomes when your sense of identity becomes fractured. The unravelling of her persona was so well crafted by the author that I could not get this story out of my head, I thought about it for days and when the book ended I couldn’t read another book for a week while I tried to reconcile myself with Smudge’s life and the many trauma’s she had to endure. I took off one star as it took me some time to get into the story. I felt confused for the first 50 or so pages about what was going on and which twin was which. I did however reach a point where I became more confident about their identities and from there really got into the story. I reached a point in fact where this book became impossible to put down and I just had to reach the end and find out Smudge’s fate. This book played with my emotions big time and that is why I liked it so much. I really rooted for Smudge and couldn’t understand why no one else ever did. Her story really pulled at my heart strings. A fantastic read with a protagonist like no other you will ever meet. A must read for anyone who wants an emotionally engaging story. 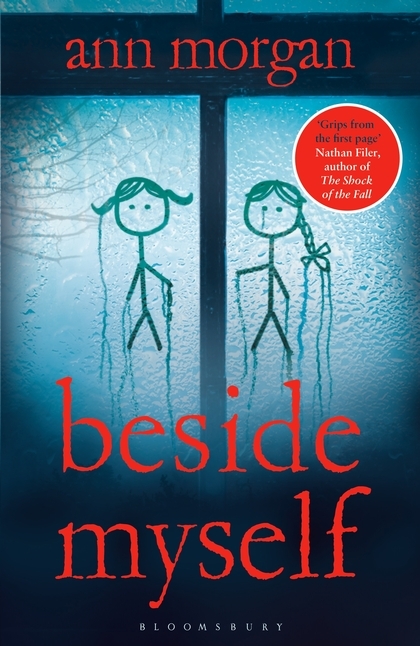 I would like to thank Netgalley and Bloomsbury Publishing for the ARC copy of Beside Myself that I received. To find out more about this book or to pre-order please follow the below links. Its been a crazy day Simon. There was a massive car crash on the motorway in Dublin and traffic was gridlocked everywhere as a result. It took me two hours to do the school run this morning. I had to just ditch the car and run to school in the end. But when I heard what happened and that a woman was left fighting for her life in hospital, it put a lot of things in perspective for me. How is your Wednesday going? If you do ever get round to reading Beside Myself I would love to know what you think. Where I live there are relatively frequent crashes and we all have to think about how grateful we are to be alive, every day. If I do read it, I will let you know. Would you rather on here or should I email you? Yes things like that really make you sit back and think. And thanks, I will try stay safe. I am a careful driver but I guess at the end of the day its other drivers we need to watch out for. Great blog and oh my goodness this sounds absolutely incredible! I have to read it! Thank you so much, that is very kind of you. Wow this book sounds incredibly compelling! This must go on my TBR immediately. Wonderful review, you really got me hooked on this one! Thanks so much Lucy, I’m so pleased you liked the review and might read it with your book group. Only 2 more months until it’s published. I think Ann Morgan might be an author to watch out for. Wow, what an amazing concept for a book. You reviewed it beautifully! It sounds like this is a must read! I’ll have to get myself a copy! Thank you Kate, I hope you like Beside Myself as much as me. I am still thinking about it weeks on. I’m sure I will. It certainly sounds like a very interesting read! Thank you so much for the follow! I’m so new at all of this! I am very grateful for the support. That sounds beautiful! I am so glad to have joined this community. Thank you for being so lovely to me! Fantastic review. Really perceptive. It’s a fascinating premise.